When appraising antiques, one of the first things that we look for is a makers mark. No, we are not talking about whiskey folks… we are speaking of a mark placed on an item by the manufacturer, craftsman or artist. These marks are typically found in inconspicuous places. They may be hammered into metal items, stamped or branded on to wood, engraved, labeled or in the case of a work of art, signed or autographed. Any markings that we find will typically help date an item and in some cases help determine the value. The stamp on this old hinge is a great example of a maker’s mark. 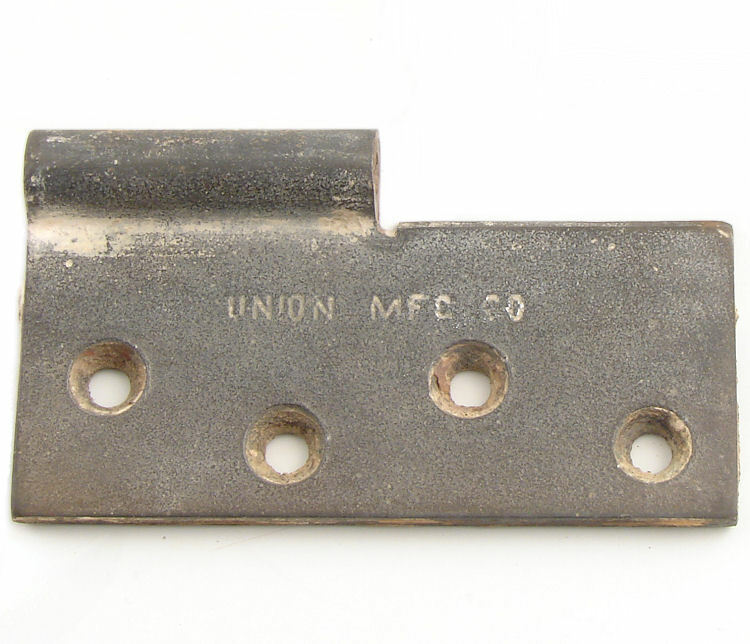 This tells us that the hinge was manufactured by Union Mfg. Co. A little research reveals that the Union Mfg. Co. manufactured hinges and other non tool items from 1880 to 1919, thus giving us the ability to date this item. Quite often research will uncover very interesting information about a company. IBM, which had it’s beginnings in 1880 as a business machine company, for example, manufactured rifles and engine parts for the government during WWII as did many other manufacturing companies in the U.S. This type of historical data adds to the intrigue of an item. Another great example of a makers mark is the stamp on this wood slat. Stamping or branding wood items is typically the last step in the manufacturing process. Stamping is a permanent method of including a company logo, manufacturing information or even care instructions onto an item. Permanent stamps can often be found on the back of furniture or on the inside of a drawer. Items that are built for industrial use such as crates and pallets will often display stamps in a more prominent location. Realizing the historical relevance of the makers mark, we recently began placing a permanent stamp on our custom built wood items. The last thing that we do before a custom door leaves our wood shop is stamp it. Our hope is that somewhere down the road, perhaps a hundred years from now, someone will be researching and gathering historical data about a beautiful solid wood door that was crafted by Southern Accents. Are you leaving a mark? If you are an artist, craftsman, carpenter, seamstress, etc., we encourage you to come up with your own unique makers mark. Leave a permanent imprint on the items that you create that will allow future generations to trace the items history. We recently ran across this video and just had to share! Everyone who works at Southern Accents is a team member. We have the word TEAM printed on our shirts. One of our primary work related goals is to promote historical preservation as well as a social consciousness for re-purposing salvaged items thus reducing the amount of waste filling up our landfills. One of our primary personal goals is to work together to make this world a better place. We are all about community, all about helping our neighbor, all about encouraging one another and doing what we can, when we can, to help those around us who need a boost. When we saw this video it made us smile. We want you to be on our team. Let’s work together to make this world a better place. Let’s encourage one another. Let’s be awesome together. Let’s give the world a reason to dance! Please take a moment to watch this video. We think it will make you smile as much as it did us. When you are done, pass it on. Share it with your friends. Post it to your Facebook page. Spread the joy! Given the fact that we are passionate about salvaging architectural antiques and goods, it warms our hearts to no end to see a finished project resulting from a customer’s creative vision. Daily we see salvaged goods and architectural finds go out the door but seldom have the opportunity to see the end result. We love it when our customers share their pictures with us. We are inspired by the transformations and relish the opportunity to share the photos with others in hopes of fueling their creative juices. One of our customers, Justin Dyar, recently shared a couple of pictures with us. 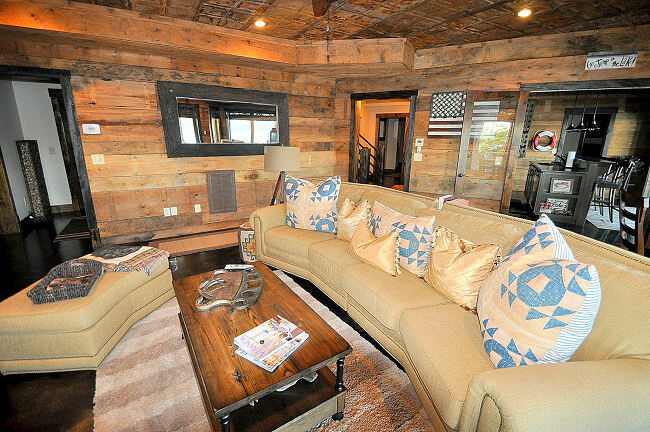 This incredible residence which sits on the beautiful Smith Lake features salvaged wood from Southern Accents on both the floors and walls. Justin also installed salvaged tin on the ceiling in this downstairs room. When asked why he chose to use salvaged goods instead of new, Justin said that he wanted a modern style with a rustic feel. He chose to blend the use of salvaged items with new materials in an effort to create the look and feel of a weekend getaway. Justin also purchased an antique mantel from Southern Accents for use in this home. His motto, “the older and more scratched up the item is, the better it looks in my home!” We simply agree! Justin also chose to use a few antique items in the home’s decor. 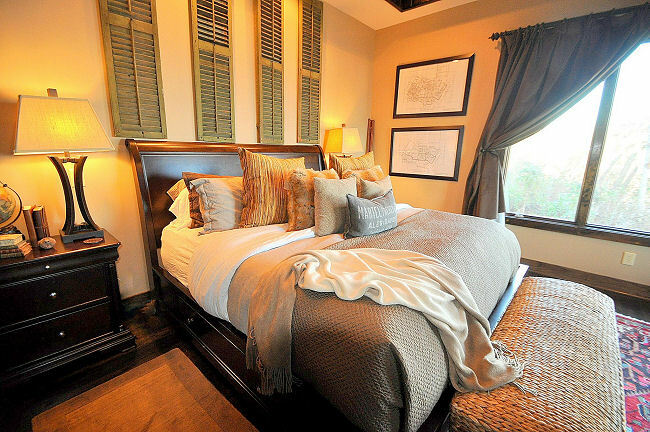 These old shutters, which were also purchased from us, are used as a focal piece behind the master bed. Justin also incorporated some old rustic iron pieces throughout the home. When asked about his experience with Southern Accents, Justin replied; “Southern Accents has some of the most unique decor items and vintage materials that I have ever seen. I have been to many antique stores throughout Alabama and the Southeast, and Southern Accents in downtown Cullman has a better selection than anyone.” Thanks Justin… we’ll take that! The use of salvaged goods and architectural antiques can add so much character to your home or business. It is also a way to contribute to the viability of our planet. The reuse of salvaged wood alone is a major step in the right direction. Come by and talk to us about your next building or remodeling project. We would love to help! We would also love to see more finished project pictures from our customers! If you have an awesome picture you would like to share, please send it to info@sa1969.com. Include your name and a little information about the architectural piece or salvaged items purchased from Southern Accents and how you used them. Take Me Down To The Little White Church! One of the most fulfilling tasks that we undertake at Southern Accents is going out on a salvage job. Once we purchase salvage rights to a building that has been scheduled for demolition, we go in and take everything that we deem reusable. One of our favorite salvage expeditions to date was Center Methodist Church in Shelbyville, Tennessee. This little, white, one room church was built in 1887 by German Morgan and his son on land that had been donated almost 50 years earlier by a man named Michael Holt. The building was expanded in 1963 when Sunday School rooms were added. By 2008 the little building was no longer in use and found itself sitting on private property. The property owner had concerns about safety as well as vandalism which lead to his decision to have the structure removed. Southern Accents Salvage of Center Methodist Church. Southern Accents purchased the salvage rights and was thrilled to discover that we were able to salvage almost every piece of the building for re use. Our favorite item from the church was this incredible three tier oil chandelier. The picture above shows the original light as it hung in the church on the left. The picture on the right is the light as it hangs in our showroom. The bottom is a picture of a wooden board that was found by the owner while tearing out the walls. One of the names on the board is Mrs. Sue Riggs Gill and the date 1887. Mrs. Gill donated the oil chandelier which was later converted to electric and used until the building was taken down in 2008. The detailing on this unique light is magnificent! The original shades were removed and stored for safe keeping. We love uncovering and preserving historical content. Being able to trace the history of an item and pass it on to the new owner is the most exciting aspect of what we do. This light currently hangs above the staircase in our showroom and is available for purchase. Visit our website to view details and pricing information on this unique light. It’s A Dog’s Life – Update! June 2012 we set a goal of sending out one informative newsletter per week to our subscribers. We wanted to provide interesting content centered around the things for which we are passionate; our business, family, and community. Our second newsletter titled “It’s A Dog’s Life” introduced our readers to Bobbie and Chance. Many of you have asked, so we want to take this opportunity to provide an update on the adventures of our two rescue pups! 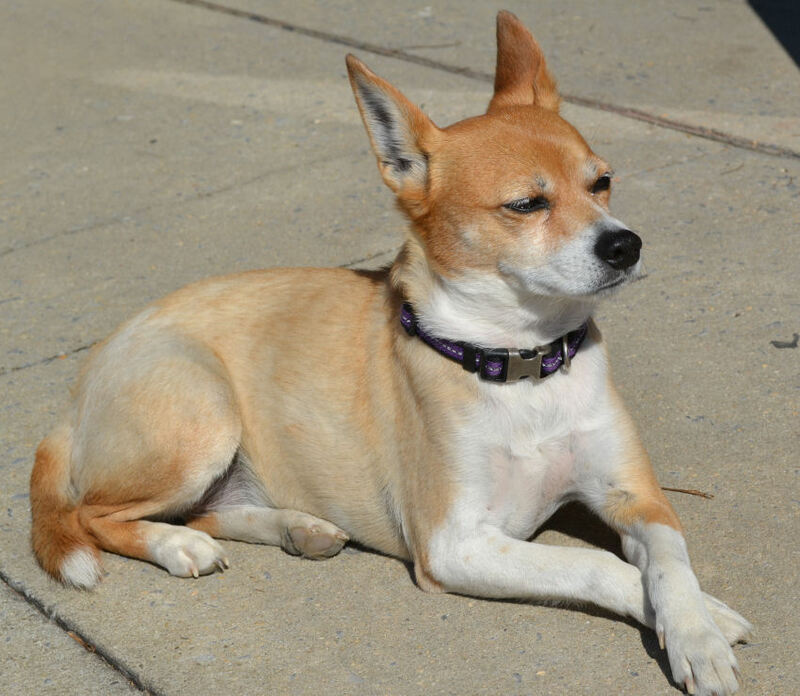 Bobbie, who typically resides in the front window of the showroom, was caught this day doing a little sun bathing on the side walk. Activity in and around the store is typically done under Bobbie’s watchful eye. She continues to patrol the area but these days her steps are a little more spry thanks to Chance who keeps her on her toes… or rather her paws! As suspected, the biggest change over the past six month’s has been with Chance. The cute little parking lot pup has grown into a 70lb horse! There is never a dull moment with Chance around. In the past six months he has consumed one sofa, approximately six dog beds and most recently a Christmas tree’s worth of ornaments. His comical escapades include smashing face first into the glass door as he tries to catch the bugs… on the other side of the glass! Comical as it may be to watch, we often suspect that Chance may just be one fry short of a Happy Meal! Chance’s favorite activity is riding shot gun around town with Heather. Make no mistake, his claim on the front passenger seat of her vehicle quite often relegates Garlan to take a back seat, literally! 3:00 am walks to “take care of business” has Heather feeling as if they have a new baby in the house. Together Bobbie and Chance are quite the pair, providing plenty of daily entertainment. Bedtime finds them settling down together, side by side. They have a true affection for one another. Despite the occasional frustrations of trying to train a lab puppy, we suspect that life without Bobbie and Chance might just be a little dull! 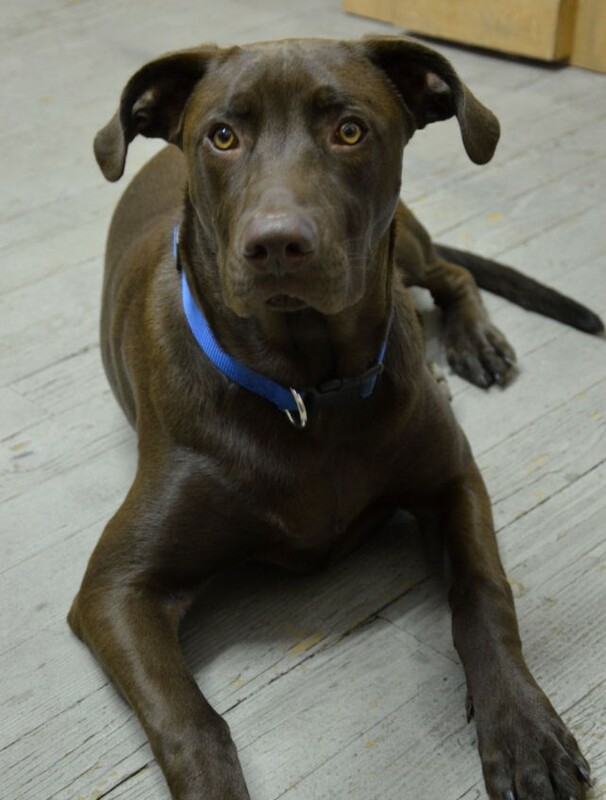 If you have the opportunity to stop by our showroom make sure you ask about the dogs. Most likely you’ll find Bobbie snoozing in the window or patrolling the sidewalks. There’s a chance that you will see Chance although he’s currently banned from the showroom until he outgrows his ‘active puppy stage’! If you missed their introduction you can catch their story on our BLOG. Those who love and appreciate architectural antiques the way we do seem to understand that each piece is unique. The beauty of an architectural relic can be found in both the design and the craftsmanship. We hold a certain amount of awe and respect for the history of each piece that enters our showroom. Occasionally we will acquire a specific item that we become particularly attached to, as is the case with this 1890’s balcony. The balcony was acquired from a picker in Chicago 8 years ago. It was one of two beautiful pieces attached to a structure that was scheduled for demolition. The demolition crew underestimated the weight of the pieces. When they tried to move the first one, the tow strap broke and the piece hit the ground, shattering. Thankfully the second one was safely removed from the dwelling and in 2004 found it’s way to Southern Accents. 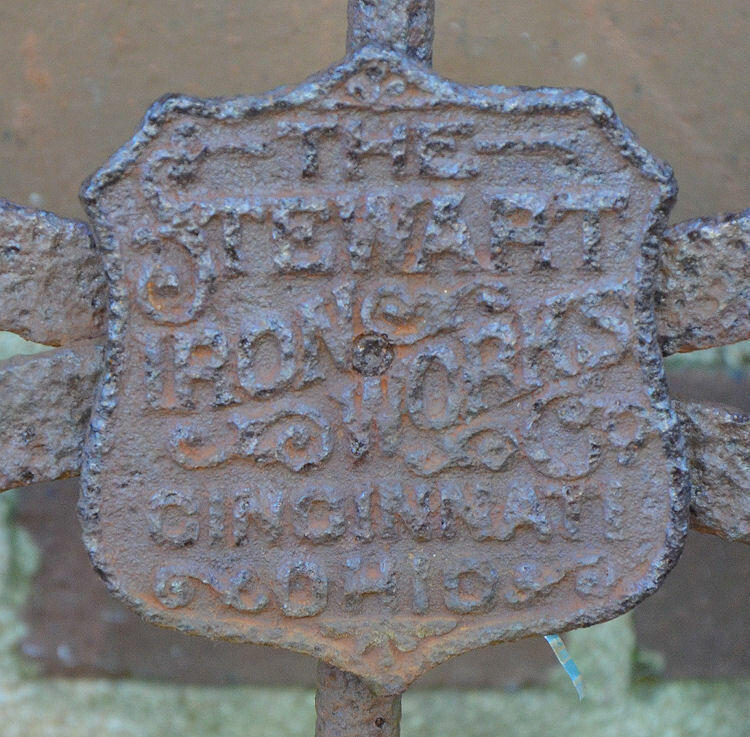 The 8 foot long iron piece was placed in the “Alley”, the outside area between our showroom and our mantel warehouse. Over the past 8 years this beautiful piece has served many purposes. It has been a very popular prop for area photographers. Because the balcony was housed outside, photographers showed up often, camera in hand, subjects in tow, ready to capture pictures. This picture was taken recently by local photographer Shelly Smith. The balcony has been used many times over the last 8 years as a prop by local photographers. The balcony has also served as a focal point and resting place during our famous alley parties! The balcony which has been a recognized mainstay on our property for all these years has found a new home! It recently traveled north to Kentucky where it will be given a new life with it’s new owner. Moving the balcony was no easy task! Although we are always thrilled when one of our favorites finds a new owner, this piece will be missed. Currently there’s an empty spot in the alley. We’re all trying to decide what’s going to take it’s place! The balcony awaits the arrival of it’s new owner! A big thank you to Shelly Smith Photography! Shelly snapped the first two pictures above during a recent photo shoot.